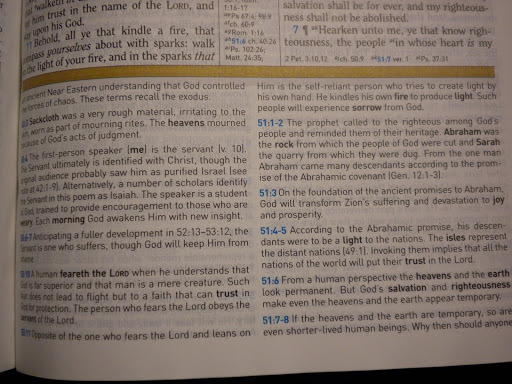 If you read my review of the Chronological Life Application Study Bible, you may recall that I really like bibles that are in full color (which typically applies only to study bibles from what I have seen so far). It is strictly a preference on my part. Not that they necessarily make it easier to read or study the bible – I just find it aesthetically pleasing for me. You may be different in what you like. I requested an evaluation copy of the Holman Full-Color KJV Study Bible from B&H Publishing so I could review it. I accidentally requested the hardcover version and with the completion of this review will be requesting the leather bound one for another review as I feel more people would be interested in the nicer leather bound one for their personal use than a hardcover. Watch the blog for a follow-up review for that version of this bible assuming B&H is willing to send it to me. I’m looking forward to reviewing that version. I have to admit that I was pleasantly surprised by this particular bible. The Study tools are done very nicely, although admittedly, I would have liked to see some of the study notes go into more details and a deeper dive into the cultural and historical background. As I mentioned this review is of the Jacketed Hardcover version of the Holman full-color KJV Study Bible, which I would recommend highly if you want a good desk reference study bible. I hope to do the leather bound review which would then end up being the bible to carry around (for those of us that like a thick, heavy bible to lug around with us. 🙂 Printed on nice opaque paper (less show through from back side of pages), nice color photos and other full-color items. Easy to use. Overall a thumbs up for this bible. Price: At the time of writing this review, the cheapest place to get this book is at Christianbook.com. They have it for $28.99– suggested retail from the publisher is $49.99. Please note that these prices do not include any potential shipping charges. The Holman&nbsp;KJV Study Bible is a new edition modeled after&nbsp;Holman’s 2011 ECPA Christian Book Award-winning HCSB Study Bible, where every well-conceived study help is practically placed on the same page spread as the related biblical text. It also features 15,000 study notes, 141 photos, 62 timelines, 59 maps, 40-page concordance, 20 articles and essays, 16 illustrations and reconstructions, 15 charts, and a helpful glossary of 17th century expressions relative to the KJV&rsquo;s signature phrasing. 50 page concordance (not exhaustive by any means, but then again, if you’re a serious bible study person, you probably have a separate concordance like Strong’s Exhaustive Concordance or something similar). Art Credits page for Photos, Illustrations/Reconstructions and Charts. OK, this is the part where I get to tell you about how I like or dislike this bible in a detailed manner. What I typically try to do is do a quick glance over the entire book at a high level to get a feel for it. Then I will go in depth in a shorter book such as Philippians so I am comparing the same thing from bible to bible. That gives my reviews a certain consistency to them. I would say that this bible is very easy to use. I’m not going to go into the readability of this version vs. that version. To any bible reader/student, the tools and layout/design of this bible are done nicely thus making the usability very high in my opinion. 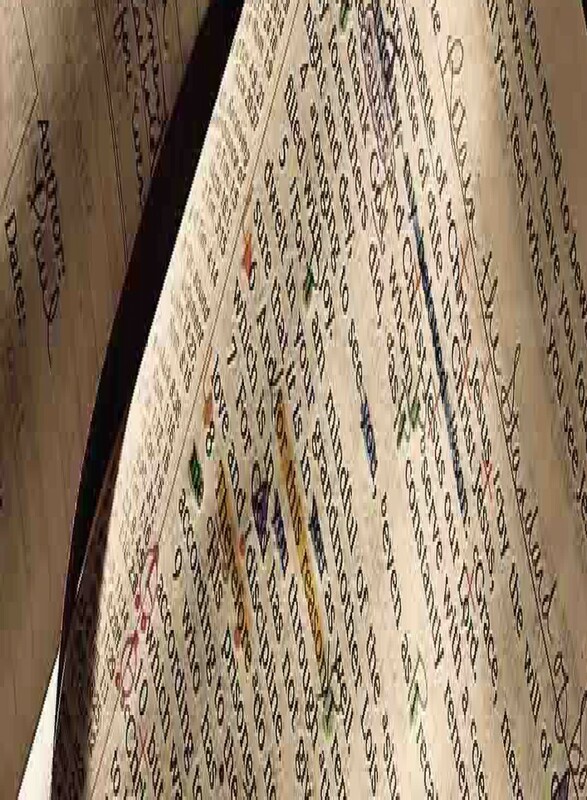 The extra-biblical reference materials and commentary have a very natural flow to them. Quite a lot of study notes – as I mentioned before, some don’t go into much detail while others do go quite deep. Glancing through a few of the Essays, they are pretty good, most of which are from authors with a background in the Baptist church. Maps are done nicely in color, however on some of the maps, the font size is very small which would make it hard for some people to read without some kind of magnifying tool. Illustrations (hand drawings) are done pretty well. I did really like the one about the High Priest’s Garments on page 151. Example Topical Chart for Proverbs. Charts are done very cleanly. 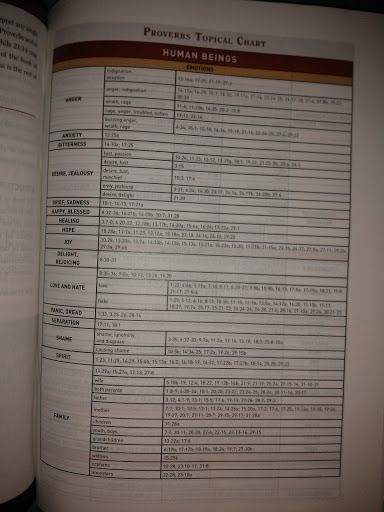 As a very nice example, on page 136 is a chart of the Ten Commandments which shows the Commandment, the Passages where the Commandment was given, any related Old Testament passages, any Related New Testament Passages and then Jesus’ teachings related to the Commandments. Additional comment – The Proverbs Topical Chart on pages 1039-1044 are done very nicely giving you where to look in proverbs for certain topics and are grouped nicely like Emotion (Anger, Desire, Grief, etc. ), Godly Traits (Fear, Humble, Integrity, Pure, Righteous, etc. ), Ungodly Traits (Evil, Fools, Pride, Sin, Vanity, etc.) and other great principles. The book introduction pages are done very nicely and give a great background to each book of the bible. This includes a timeline for each book as well which helps the reader to get an idea of the timing of the events surrounding the time of when the book was written. From the quick glance through hitting multiple random commentaries, it does seem to have a pretty solid foundation. the indications of a Smyth (section) sewn book. For a Hardcover Bible, I would say that this appears to be a fairly durable bible. Again, please note that I have a personal preference toward leather bound books. 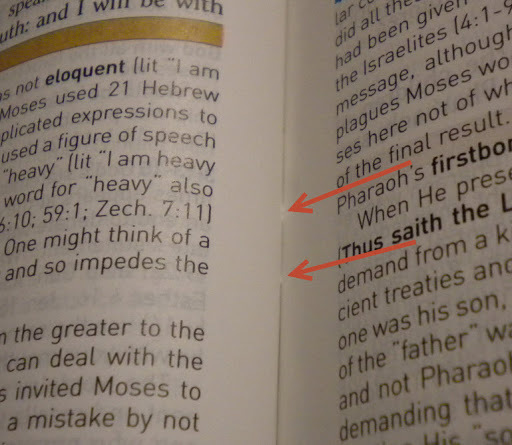 This bible does appear to be Smyth Sewn (or section sewn), which means it will hold up better than some strictly “perfect bound” or glue back bibles (similar to general paperback books). Due to this being hardcover, I would probably classify this as more of a desk reference version vs. what I would call my “carry around with me” bible. Thinking that might change if I get a chance to review the leather bound version. Scriptures appear to be about 9 point Times Roman font, which tends to be fairly standard size and font used in many bibles. Showing smaller sized font for Study Notes. The study notes are substantially smaller in point size (maybe a 5 or possibly 6), but it is done in a very clean font (similar to an Arial or Verdana possibly). Study Notes verse number references are done in that nice light blue color and the text is black. 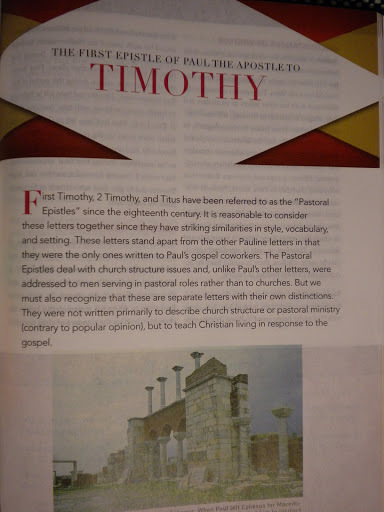 When a portion of the study note quotes directly from Scripture, the publisher put those quoted words in a bold font. Cross References in blue color. 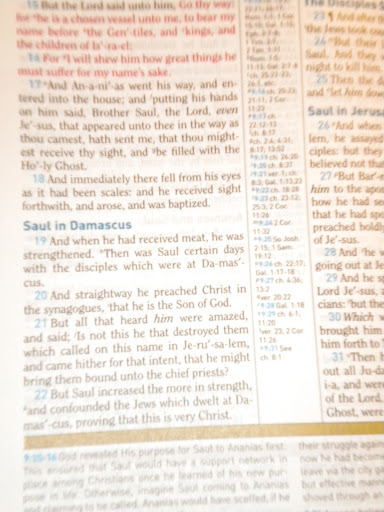 The section headers (such as “Saul in Damascus” for Acts 9:19-22) and the chapter numbers are in a very pleasing blue color which gives it a nice distinctness from the actual scripture text which is in black. The actual verse numbers are in a slightly lighter blue hue. The center-column cross references are distinguished nicely by the verse being in that same lighter blue and the actual cross reference being in black. below looks to have the correct colors. Words of Christ are in red, but you may notice that the color is closer to the magenta side vs a true red. Some people would interpret this color as a darker pink. It doesn’t look bad – just different from what I would normally expect. NOTE: from a purely technical perspective, true red is obtained by using 50% magenta and 50% yellow on a printing press in two separate printing units. Sometimes you could argue that the printer had too little yellow giving the Words of Christ this pinkish-magenta hue. 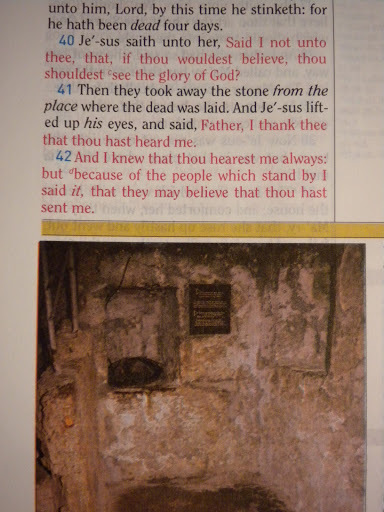 However this is not true because, for example, on page 1784 the Words of Christ in John 11:34-42 are directly “in-line” with a 4 color photograph directly below. If the yellow was too low, this color photograph would look terrible. It does not. Therefore the color appears to be an intentional design by Holman. Plus, the color seems to be pretty consistent throughout the scriptures. Paper used for this bible is a nicely opaque paper so you don’t get nearly the show through that you do with other bibles that use cheaper/thinner paper. Full color maps, photographs, charts, timelines, and other content are done very nicely and the print is very good quality. Reading and studying in Philippians and Is very easy to do with how the publisher laid out this bible. Starting with the book introduction to the study notes – all very well done. Again, the book introduction is very nicely done giving some great background to Philippians as well as the overall message of the book, covering church unity, freedom from legalism, stewardship,and more. Cross references seem to be very solid depending on which portion of the verse you are focusing on (which would be true with any cross reference in any bible). Study Notes are done very cleanly and concisely without getting too wordy. I would have liked to seen more of the cultural and historical background of Philippi given in the study notes, however. The commentary in Philippians seems to be pretty solid. As mentioned previously, to notes don’t go into great depth, but overall, I would say it seems to be very helpful A little more on the history and culture would be good to cover, however. Quality: 8.2 (I rated this a little higher than I normally would have. I will never rate a hardcover book higher than a nicely sewn and bound leather book simply due to long-term durability. Basically, this means without proper care, any hardcover bible type will not last as long as the leather bound sewn version of that same bible). I hope to get a copy of the leather bound version of this bible so I can do a review on it as well. Innovation: 9 the full color pages seem to make it much easier for me personally to read and use this bible. How to study the Bible section is very practical and will be handy for many users. This entry was posted in B&H Academic, Hardcover, Holman, KJV, Study Bible, Study Bible Reviews, Word of God. Bookmark the permalink. Thanks for the kind words, Mark. 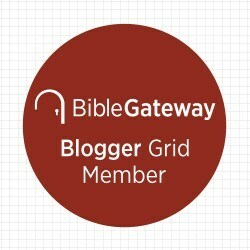 Hopefully many others will find my posts helpful to them in studying the Word of God. Very nice review. Appreciate the attention to detail. 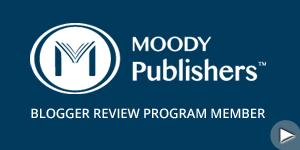 When looking at reviews, it's helpful (as you have done) to provide a summary for those who want a quick review, but also provide a more in-depth section for those of us who like that. Thanks for putting the time in on this!